This study aims to find out the perspectives of pre-service and in-service English teachers about the participation of stakeholders and role of inspection to improve the generic and field-specific teacher competencies set by the Turkish Ministry of National Education (MoNE). This study is based on qualitative research methods since the data were collected with the help of a written interview from where the participants answered two open-ended questions and the data were analysed and categorized by two coders according to the constant comparison method of grounded theory. 366 pre-service and 84 in-service English teachers participated in the study. The findings show that about half of the pre-service teachers (N: 179, 49%) and one third of the in-service teachers (N: 28, 33.3%) held positive attitude towards the participation of stakeholders to improve teacher competencies. However, some teacher candidates (N: 111, 30.4%) and in-service English teachers (N: 30, 35.6%) had negative opinions about the role of inspection on their professional competencies. In light of the findings, it can be said that while the participant English teachers are in favor of stakeholder participation they have some concerns about the implementation of inspection. ISNAD ATMACA, ÇAĞLA . "ENGLISH TEACHERS’ PERSPECTIVES ABOUT STAKEHOLDERS AND INSPECTION". 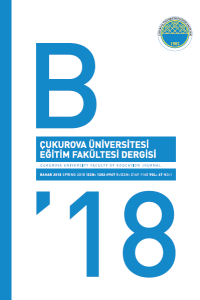 Cukurova University Faculty of Education Journal 46 / 2 (October 2017): 766-788.